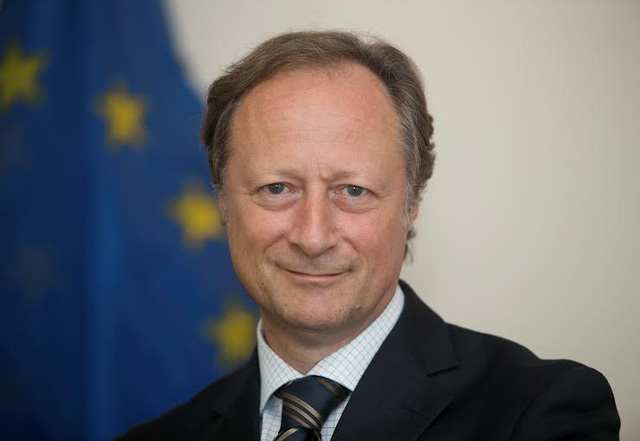 On occasion of Europe Day on May 9, DTiNews presents an article written by Ambassador Bruno Angelet, head of the Delegation of the European Union to Vietnam. Ambassador Bruno Angelet, head of the Delegation of the European Union to Vietnam. Today, the 9th of May, we celebrate "Europe Day". On this day, in 1950, five years after World War II, Robert Schuman proposed a plan to integrate Europe, an “indispensable step to maintain peace”. That plan achieved outstanding success. Today Europe is facing major challenges, but the new Europe – through its Member States and Institutions - also brings fantastic opportunities, to Europeans and to friends all over the world. This world is full of potential. International integration creates opportunities for Vietnam, in particular through your unique friendship with Europe. For decades our countries and institutions have been helping Vietnam improve conditions for your citizens. First with humanitarian aid, now in almost all provinces and cities, all areas of governance: health, education, justice, agriculture, infrastructure, energy or trade. Our companies invest and trade with Vietnam, bring your goods to international markets, including the EU. Many of you are proud to have your children studying in Europe. You travel increasingly to our continent. Together we have created better opportunities for all. The world is also facing great challenges. States’ brutal recourse to force, and hatred inspired by extremist ideologies destroy so many lives. Many Vietnamese friends warmed our hearts with their care following recent terrorist attacks in Paris and Brussels. Yet, beyond Europe, many more people live in much worse conditions and suffer even more from other threats: climate change, pollution, disruptions from the world economy. Over the last 20 years Europe never lacked resolve to address these challenges, while undergoing sweeping change. Back then we were only 15 countries, today we are 28. Back then, the EU was an internal market dealing with agriculture, aid and trade. Now we’re the world’s biggest economy, generating 30 per cent of its wealth. In space we will soon deploy a state of the art satellite navigation system “Galileo”, which, by 2020, will serve societies and businesses in Asia. We lead the fight against climate change and in greening the economy. We’re the most generous contributors to development aid and were key in achieving the Millennium Development Goals and concluding the new Sustainable Development Goals. In the last 15 years, the EU has engaged in foreign policy and crisis management. We brought peace between Kosovo and Serbia, contributed to a truce in Georgia and stopped civil war in the former Yugoslav Republic of Macedonia. The EU was the chief negotiator in the recently concluded agreement on Iran’s nuclear programme. Since 2003, the EU has deployed over 80.000 military and civilian personnel in peace-keeping missions that stabilised the Balkans, Chad and the Congo, accelerated the peace process in Aceh (Indonesia) and helped eliminate piracy on the seas of the Horn of Africa. The EU is facing major challenges, but is proud of our achievements. Vietnam has understood our increasing capacity to promote a "prosperity and peace agenda", including in South-East Asia. This inspired Vietnam’s leadership to promote a strategic partnership between the EU and ASEAN, to conclude with a “Partnership and Cooperation Agreement". Our companies are the biggest investors in ASEAN. They bring the biggest non-Asian investment volumes to Vietnam. Our Free Trade Agreement with Vietnam, to be implemented by early 2018, will trigger a “second wave” of European investments. We support Vietnam’s pursuit of sustainable and environmentally responsible development through energy sector reform and fostering renewable energies. Both the people of Europe and of Vietnam aspire for just, free and prosperous societies, and international relations ruled by law. As with free and responsible citizens in society, the world community should be made of free, equal and responsible nations protected by the international rule of law. Celebrating Europe Day, we wish that Europe will bring fantastic opportunities to friends all over the world, in particular to the people of Vietnam. Our partnership is the best we have for the future, our future, both in Asia and Europe.